SIALKOT: Hundreds of male and female Sikh pilgrims from around the globe have arrived in the country to attend the 479th death anniversary of Baba Guru Nanak Dev Ji, the founder of Sikhism. On Thursday, they visited Gurdwara Babey Di Beri in Sialkot and offered their religious rituals amid tight security. Some pilgrims from India also recalled their pre-partition memories. Speaking to media representatives, the Sikh pilgrims lauded Pakistan government’s efforts for looking after their sacred places and safeguarding the rights of minorities in the country. They also thanked Pakistan for rendering great hospitality to the Sikh pilgrims. The Sikh leaders, Sardar Sohan Singh, Sardar Manmohan Singh, Sardar Gurpreet Singh, Sardar Badal Singh, Preet Kaur, Naseeb Kaur and Sukh Pareet Kaur, said that Pakistan was undoubtedly a peaceful country and the people of Pakistan were also very peace-loving. They also said that they could never forget about the love, affection, care and hospitality that the Pakistanis have given them. They pledged to make all-out efforts to promote a soft image of Pakistan globally and wished the country durable peace. “Strong ties between both Pakistan and India are the need of the hour,” they said, stressing the need of meaningful peace talks between the two nuclear powers. 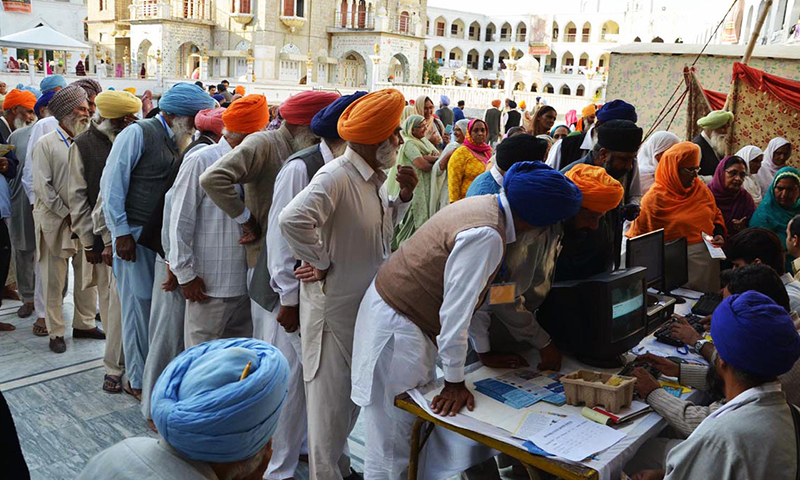 Sardar Jaskaran Singh Sidhu, at the occasion, said that the Sikh community in Pakistan, India and Europe had warmly welcomed Pakistani government’s proposed decision to open the Kartarpur border to facilitate Sikh pilgrims and added that visa-free entry of the pilgrims to Gurudawara Darbar Sahib Kartarpur would be a great initiative. Minorities MPA Mahinder Pal Singh said that India must give a positive response to Pakistan’s sincere efforts regarding the opening of the Kartarpur border. Later in the day, the Sikh pilgrims also visited Darbar Sahib Kartarpur in Shakargarh. It is worth mentioning here that pilgrims from all over the country and abroad are arriving in Kartarpur to attend the three-day rituals of Guru Nanak’s death anniversary. According to Evacuee Trust Property Board (ETPB) officials, they have completed the preparations for a comfortable stay of the devotees arriving in the country. The district police have also claimed to have made fool-proof security arrangements for the event. Walk-through gates and CCTV cameras have been installed besides the establishment of a monitoring room. According to official estimates, some 3,000 Sikh devotees will attend the concluding ceremony of the event on September 22.